Hello and welcome to my blog!! 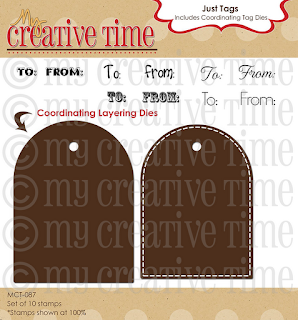 Today we are hoping with the My Creative Time design team and two guest designers for the September Mini Release. I am really loving the awesome sets that Emma put out this month.....it may be a mini release, but it is sure mighty!! For my first project, I created these fun little sucker holders for my nieces/nephews for Halloween. I used the Stitched Lollipop Holder die and the Scallop and Stitched circle die along with the Treats for my Sweet and the new Just For You stamps. I used my Cricut to cut the pinked edged circles. If you missed the post with the project I did with the All Around Goodies, CLICK HERE to check it out. Great projects with great stamps and dies. Darling little Lollipop holders! Love the Halloween theme! I love the halloween lollipop holders--very cute. Love the skeletons. I also love the color of your tags - really nice. Thanks for sharing. wow i love the pop holders and the tags great job!!! Everything is super cute. I love the cuts you used. awesome job Amy!! great colors too! Love this project! Thanks for sharing! Love the sucker holder! Another one I need! Darling projects! Love the sucker holders and tags! Love the new designs! Lovely projects Amy, love the holder! Have a lovely day! Your lollipop holders are so cute! I just love the skull and cat at the bottoms of them! And your tags are just gorgeous!!! Amy ~ The lollipop treat holders are ADORABLE!!! I LOVE all the details and you used a Cricut cut for the center too! CUTE! Oh your Christmas tags are just GORGEOUS!!! LOVE the heat embossing and the way you did your ribbon! Way to go ~ ready for Christmas!! Awesome job! Great Halloween treats!! Your tags are so pretty too!! Great job!! WOW!!! What awesome projects using these adorable new release sets!! Beautiful projects! Need to hop quickly and go place my order! Awesome projects! Can't wait to get my hands on this release! These are all gorgeous Amy. Your projects are so cute! amy, you halloween treats are too cute to spook! and I love the embossing on the christmas tags too!!!! Those Halloween Treats are Spooktacular! Awesome tip to use this release as a background stamp. Great Work! I am absolutely mad about these lollipop holders and what you did for them makes me want it even more! I can't believe I haven't gotten it yet. I have been buying the stamps and not all the dies so I will be getting this ordered because everyone makes me want it so badly! Thanks for sharing such terrific projects....I love them all! Adorable Christmas tags and lollipop holders. Your very talented! Thanks for sharing! OMGosh I love your treat holders and your tags! Even I would love getting a treat this cute! 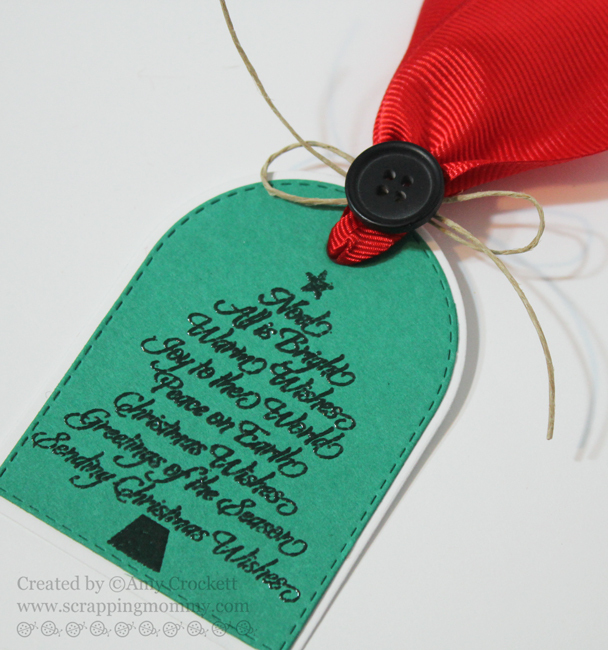 The tags are just perfect for a Christmas gift, so pretty! Such cute min gifts. The tags are brilliant. What a creative way to mix and match the stamps and dies. Love your beautiful tags, too! Wow love all the tags and treat boxes, Amy!! love how you embossed the trees on the tags. So pretty! Your projects are absolutely gorgeous! Thank you for a super fun blog hop! Loving what you did with the Lollipop holder. They are just so cute. Thanks for sharing. So SUPER CUTE! I really LOVE the lollipop holders - so fun. The tags are so pretty - LOVE the die! Great job! Beautiful creations... U guys are making me want to get gifts just to make tags!!! Love the sucker containers, the bottom is so cool!! The tags are so pretty!! Super cute, especially liked the Halloween Lollipop Holders and the little skeletons and cats on the bottom of them. Oh, to be on the receiving end of such awesome treats!! Your projects here add another layer of 'great' to the importance of giving! Thank you for sharing; now I'm four times more excited to receive my set. Can't wait. Thank you for sharing and inspiring. Oh my, your sucker holders are too cute, and your tags are gorgeous!!! Great projects! Love this mini release! Love the skeleton! My favorite stamp in this release is the Christmas tree. With the tag is is oerfect!!! Cute treat holders, love how you carried the characters from the tag down to the base. TFS! Wow, your projects are amazing, great job! Amy, those project look elegant. Love the colors. Thanks for share with us! Great projects..especially love your treat holders! My goodness I am only on the second hop and I am SO inspried. I like that you created your own layer for the circle with your Cricut. Did you get the skeleton and cat from a Cricut cut also? Great job on both projects. You did great on the heat embossing...I am still working on not having stray crumbs all over or having them blow away when the heat hits them. Love your work. Thanks for sharing. Mini but GREAT! Love the tags and all around goodies sentiments in this release. :) I still need to get the lollipop die off my wishlist! Love how your treats turned out. 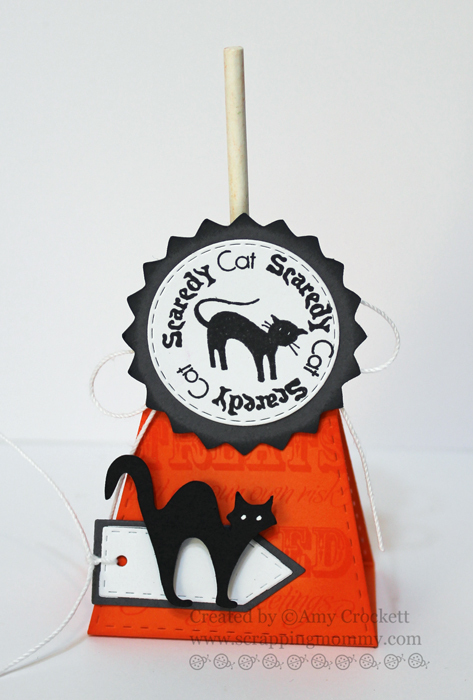 Cute tag and treat holder. Liking the new stamps! Cute treat holders. Love the little skeletons and cats at the bottom. Your tags are so pretty. Great release. Thanks for sharing. 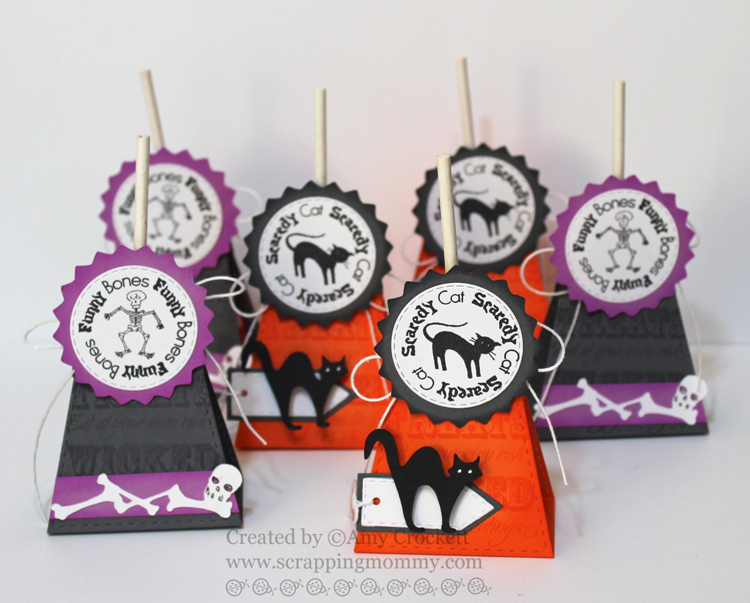 The treat holders and tags are adorable! I am loving this new release! Too cute!!!! Will definitely have to try this for my child's school. those look awesome! great projects! thanks for letting me hop along with you! Such awesome ideas! Those lollipop ones would be so great to send into school with my kids for their Halloween party! Both your treat holders and the tags are great. Such beautiful work. Loved the Halloween themed popscicle holders... very cute ideas. Super cute treats and tags. Your treat holder is so cute! I love the tags! These are the cutest projects.My 9 year old daughter would love to give the treats away to her friends for Halloween. Lollypop holders are adorable!! Love the tags! HI Love what you did with the lollypop holder and the tags are great. Omg I just love your treat holders. Your tags are very pretty. I love the new releases! Your two projects made me just have to have these releases! Thanks for sharing! Cute sucker holders and love the tags--I really like this tree shape stamp. Super cute treat holders. Love all three of the new releases. Super cute!! Now I really want the stamp sets!! Loving the treat holder & tags ... So cute! very cute projects. especially like the lollipop holders. tfs. Too stinkin cute. I have to order these from Emma, as there are a number of parties we have in the next few months! I love how you use so many of Emma's products in your project - great job! WOW, those are adorable. Love the Halloween Lollipop holders and the Christmas tags are so pretty. You have some lucky family to get those darling little suckers for Halloween. Always love anything you make! These lollipops holders are great. Thisbgives me some ideas for Halloween party favors for school. Can't wait to get mine. 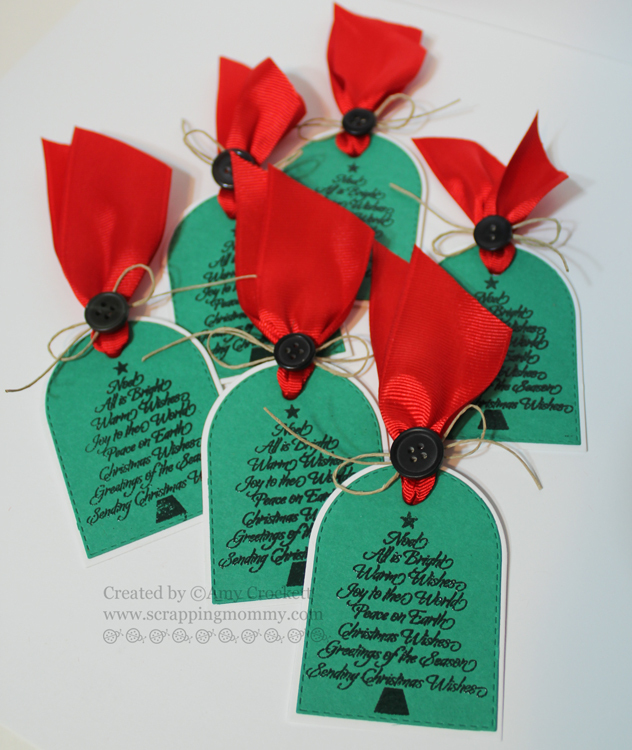 Amy I love your Christmas tags - that's exactly what I would do with them - they're just gorgeous! Actually seeing them has set in my mind that I really do need these sets after all - thanks for that! Great job on the lollipop holders and the tags. Love your Christmas tags, and I'm sure you nieces and nephews would love those cute treats too. Thanks for the chance to win. Like the little goodies and the way you incorporated your cricut along with the dies. I absolutely LOVE the way you decorated each of these lollipop holders! Beautifully done! I love the lollipop holders! So cute! Love the Lollipop holders!I have that Die and its one of my favorites! !Adrable Halloweeen Stamps!! !Loev it! A fabulous Christmas Tag! !Just Love it! Great lollipop holders, they are really cute. Thanks for sharing them and the tags. Wow Amy, the lollipop holders are just adorable. Such cute little treats. Your projects are really sweet! Nice job! 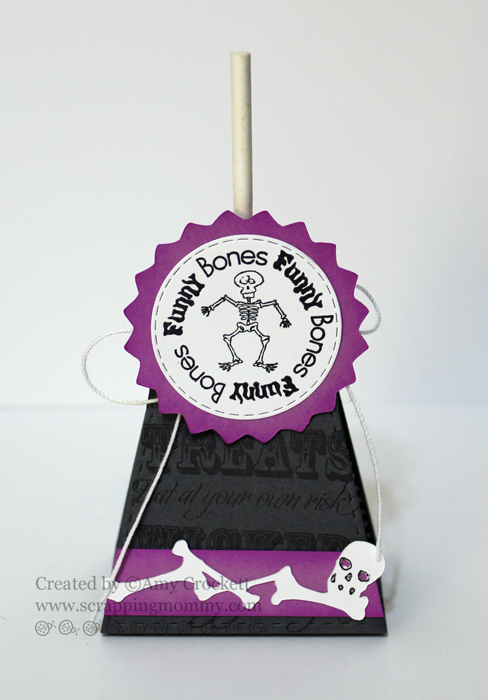 Love the lollipop holders and the way you decorated them with the Halloween items, especially the bones and skeleton. So Cute! 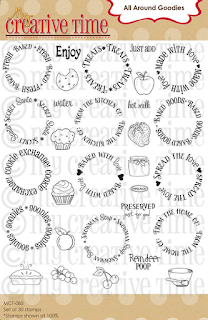 I'm thinking the All Around Goodies set is going to have to be part of my newly expanding stamp sets!